My Appreciation for my Appetizing Fans! OMGoblins! TROll 2 Autographed DVD Giveaway! My Goblins are Giddy! 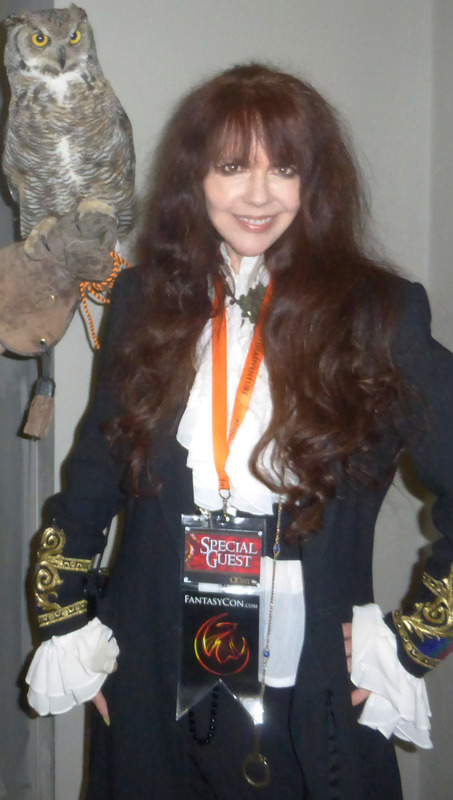 It’s the Cat’s Meow & my Goblins’ Growl! Troll 2 Autographed DVD Giveaway ~How to Win! 1 – WRITE THE PHRASE – “Troll 2 is Cool”, OR “Troll 2 is Drool” in the COMMENT BOX, below. 2 – Join me & SUBSCRIBE to my blog! IF you are ALREADY a subscriber, SHARE on Facebook – Twitter – Pinterest – Tumbler or Google+. ) Icons for Sharing on lefthand side or bottom of page or from my Fan page. Congrats to Ryan Mudd! You are the winner in your Queen’s random drawing! 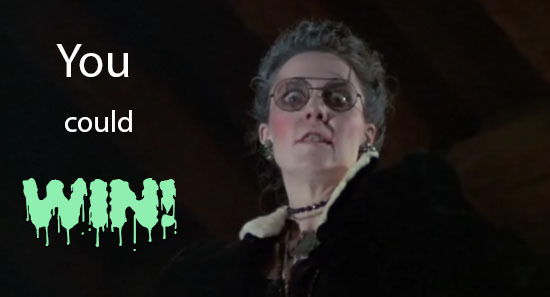 Please msg me on my fan page and I’ll get your info where to send your Troll 2 DVD! My enormous thanks for all who entered and your kind support, whether Cool or Droolers! You’re Awesome! Also, loved many of your fun stories and remarks. Thaaaaaaaaaaank you! I’ll do another Giveaway before long! What an excellent giveaway, so generous of you! Troll 2 Is Cool!!! Troll 2 is cool & AWESOME!!! I love this film. So much heart. I never thought the color green was so arousing! Troll 2 Is Cool & Amazingly Awesome! Troll 2 is cool!!!!!!!!!! And The Queen of Nilbog will always have a piece of my heart! Troll 2 is so damn Cool!!!!! Troll 2 is cool and Drool! Troll 2 is very cool. Troll 2 is cool. This movie really got me into horror. Being a kid from Utah I remember they had Utah plates on their van. Really touched home for me. Troll 2 is cool! And BADASS!!! My friends and I LOVE this movie!!! Especially your performance!!! I use either one or three exclamation point(s) apparently! Troll 2 is cool! Love from Knoxville!! One of my favorite movies ever! I’ve been meaning to take a trip over to the actual Nilbog for years now. One of these days! Troll 2 is Cool…for sure! How about some corn Credence?? All you have to do is heat it up!?! I always enjoyed Troll 2, really funny movie. Sure it’s different than the first Troll movie, but Troll 2 is Cool! Hope to see a Troll 3: Land Of The Trolls at some point. Would be great for us Troll fans. Not trolling either, Trolls are cool. Troll 2 is COOL drool! Troll 2 is cool! It’s my favorite guilty pleasure movie. Well, I don’t know why I even call it that. I have no guilt in saying that I love it! Troll 2 is SO COOL! Troll 2 is COOL!! I love it!! Troll 2 is cool and Deborah is hot. Troll 2 is cool. Just introduced my gf to it yesterday! 😀 Martyn! That’s so cool to hear about! Thanks for sharing! Troll 2 is cool! I added you in my Facebook group, “The most excellent/killer horror group” (well a while ago). 😀 Kevin! Aw, you are so kind. Your Queen of Nilbog loves Yorkshire! Troll 2 is Cool! I watched it again a just couple days ago – it’s been a few years since I last saw it. How come you didn’t get much screen time in the “Best Worst Movie” documentary? 😀 Nik! Fun to hear you watching again. I get asked that all the time. I was asked, numerous times, but I was doing a TV show (on my IMDb page) during that time and the hours were grueling. Plus, caring for a family member. Finally, in the 11th hour, I agreed and they added me to Bonus Features, which is on the DVD version. Troll 2 is (drum roll please) COOL !! TROLL 2 IS COOL!!!! SO COOL!!!!! Trolls 2 is cool and drool! I love driving through Morgan and seeing the parts from the movie! Much love Deborah! Troll 2 is Cool. Would LOVE to show my pre-teen daughters this movie and brag about who it came from! 😀 Jimsin! Great – Cool – Grool! Yay! Troll 2 is Cool! Troll 2 is cool, I drool for Troll 2 and My Green Queen Creedance! 😀 Your Green Queen thanks thee, Sanders! Troll 2 is cool! Never did popcorn look so good! Troll 2 is Cool Drool!!! Aaahhh! Think about the cholesterol! Think about… THE TOXINS…! 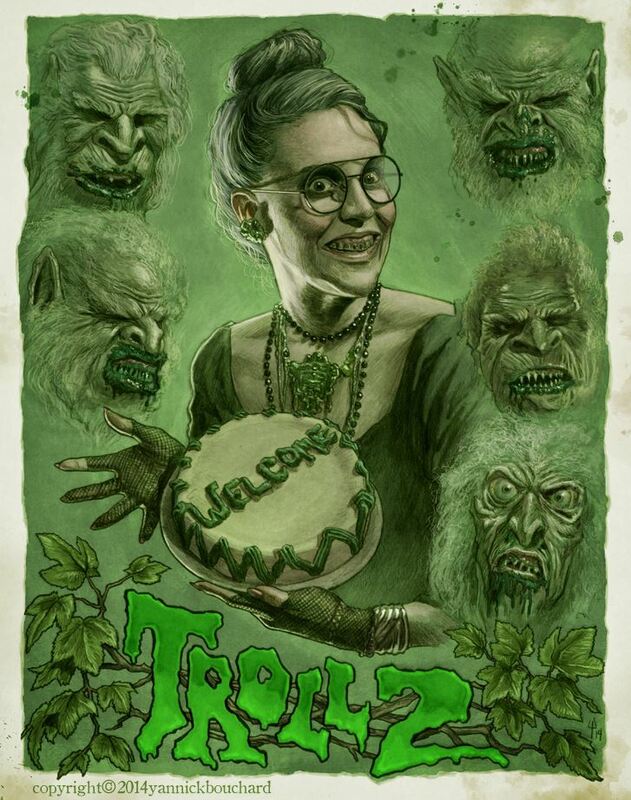 TROLL 2 IS THE MOST AMAZING, SPECTACULAR, BRILLIANT, LIFE CHANGING, COOLEST, GREATEST, BEAUTIFUL, AWESOME, FASCINATING, INCREDIBLE, MARVELOUS, PRODIGIOUS, SHOCKING, STUNNING, SURPRISING, UNBELIEVABLE, WONDERFUL, SPECTACULAR MOVIE OF ALL TIME!!!!!!!!!!!!!!!!!!!!!!!!!!!!!!!!!!!!!!!!!!!!!!!!!!!!!!!!!! 😀 Nathan! Hee – I don’t have enough words to respond to that! How ’bout . . . . that was Goblinee Sweet! Troll 2’s drool is cool! Tr ‘ole 2 is cool! 😀 Matthew! Your queen appreciates your loyalty, dear servant. Troll 2 is definitely my favorite movie. Long live the Queen! And you are very nice for hosting this contest. Thank you! 😀 Tristan! Hee… Goblin Double trouble! Troll 2 is beyond cool!!!! Troll 2 is cool! But i drool for you! 😀 LOL Brodie…. I blush in GREEN! Troll 2 is cool !! Huge fan of Troll 2. I saw it again last week at the Alamo Drafthouse in NYC. There were a lot of “virgins” in the crowd who had never seen the film before. Must have been great to be introduced to Troll 2 for the first time on the big screen! Oh, thanks for sharing your experience, James! So fun to hear your thoughts. 🙂 Hope you will spread the word about my Blog! Holy Vegetables! Troll 2 is cool! Troll 2 is cool! WAAAAY Cool! Troll 2 is too Cool! The Alamo Drafthouse theater here in Brooklyn, NY just showed Troll 2 on a crappy 35mm film print. It was all scratched up, frames were missing in some scenes, and the editing was somehow worse than it already is in the movie. I loved it, and I adore this movie……. really. Stay in school, Troll 2 is cool! 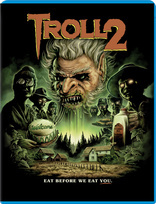 Oh so cool, Troll 2 is drool! Goblins Drool and Troll 2 Is Cool! 😀 Aimee. Hee – That is hilarious! Love it. Troll 2 Is So Awesome! Period. Troll 2 is cool… and my favorite movie! Troll 2 is super cool! Troll 2 is still cool! Troll 2 is 2 cool! Troll 2 rules! Deborah Reed rocks my Nilbog world! Oh my gosh. That is awesome that I won. Yay! Many Goblin congrats, Ryan!